The Trump Steel Tariff: How Will It Affect Industry Operations? In March, the United States announced a plan to enforce a 25% tariff on various raw and finished steel products in a move designed to boost domestic production, increase manufacturing jobs, and gain concessions from some of the country’s trading partners. A survey of leading economists conducted by the Initiative on Global Markets at the University of Chicago’s Booth School of Business showed a mostly negative reaction as to whether the tariffs would improve American welfare, even though the shares of US steel and aluminum producers saw an immediate boost in the wake of the announcement. But beyond that, the tariffs may have a noticeable impact on the oil and gas industry, which uses significant amounts of steel for drilling and the construction of production facilities, LNG terminals, pipelines, gas processing facilities, and vessels. The American Petroleum Institute (API) and 10 other energy trade organizations have urged US President Donald Trump to exclude steel supplied to oil and gas from the tariff plan. The Association of Oil Pipe Lines (AOPL) has also expressed disappointment with the tariff, saying the plan could result in jobs lost by US pipeline construction workers. President Trump on 30 April postponed the steel and aluminum tariffs for key allies by a month, including the European Union, Canada, and Mexico. As the tariffs take hold and the Trump administration releases more details about how they will be enforced, industry will be paying close attention and figuring out how to navigate a new reality. Trump said in his 8 March address announcing the tariffs that they were a matter of national security, and that the American steel and aluminum industries have been ravaged by what he called “aggressive” foreign trade practices. A number of analysts have argued that the primary target of these tariffs is China, the world’s largest steel exporter. Though China accounts for just 2% of steel imports to the US, its excess steel capacity provided a surplus output that could be sold to US companies at lower prices. The hope is that the tariffs will increase the likelihood of China speeding up the reduction of its excess capacity. On 3 April, the US released a list of approximately 1,300 Chinese exports that could see tariffs. The Chinese government responded with a promise of retaliation on a number of products, including petrochemicals, petroleum products, and specialty chemicals. Matthew Fitzsimmons, vice president of oilfield service research at Rystad Energy, said that the tariffs and any ensuing policy decisions could mean bad news for US- and China-based oil and gas steel fabricators. 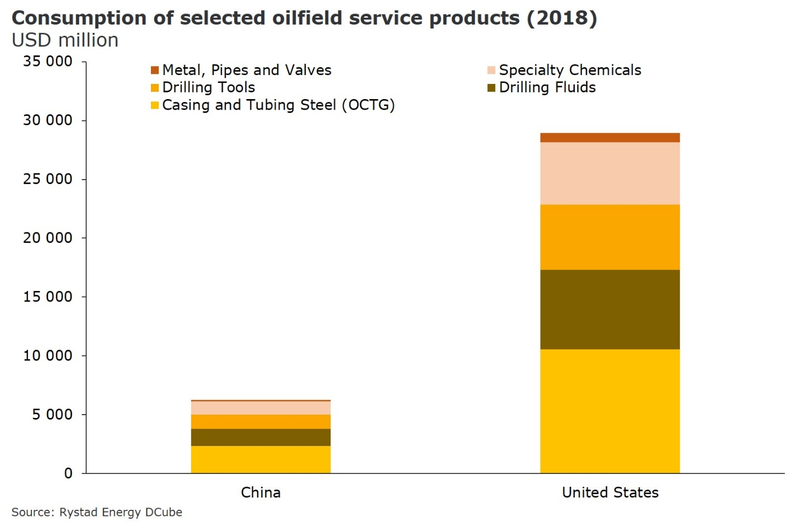 Casing and tubing steel makes up a large part of oilfield service product consumption (Fig. 1). In addition, some service companies have made significant revenue in China. NOV earned $561 million last year from its fiberglass and composite tubular businesses in China, and Fitzsimmons said the company was expected to average $650 million in annual revenue between now and 2020. He also identified Clariant, Ecolab, and Hexion as companies that have seen significant revenue from China in recent years. Fig. 1—Casing and tubing steel, metal for pipes and valves, and drilling tools combine to make up the majority of oilfield service product consumption. Source: Rystad Energy. Fitzsimmons also said that Chinese service companies like Hilong and Drill Pipe Master could also be affected by the tariffs. On 18 March, the US Department of Commerce outlined a process by which companies could seek an exemption from the tariffs in an effort to help alleviate concerns, but the process has only raised uncertainty. In its statement announcing the exclusions, the department said that “domestic industry” or “US industry” may apply, and that all exemptions will be judged in the context of US national security. However, it didn’t clarify whether foreign companies with plants or other operations in the US were eligible, nor did it specify the criteria to be used to decide which companies get exemptions, even though companies that apply must state the specific imported metal products they use and whether there is a US manufacture that produces the same product to the quantity and quality needed. The US decided to temporarily exclude some of its closest trading partners (Argentina, Australia, Brazil, the European Union, and South Korea) from the tariffs. Canada (which accounted for 17% of all steel imports to the US last year) and Mexico (which accounts for 19% of US imports of oil country tubular goods) are exempt under a carve-out provision, though the Trump administration later said those exemptions were not permanent and their status depends on a renegotiation of the North American Free Trade Agreement. South Korea, home to several major fabricators like Hyundai Heavy Industries, agreed to impose an import quota of 70% in exchange for an indefinite exemption. Ken Medlock, senior director of the Center for Energy Studies at Rice University’s Baker Institute for Public Policy, said the exclusion process, and South Korea’s agreement to limit steel exports, have heightened industry concern. He said quantity reductions can be barometers for the amount of activity that steel-intensive users can conduct, particularly if domestic production quantity does not increase in kind. If every country that exports steel to the US agrees to similar quotas, that could result in a shortfall in domestic demand relative to the supply that domestic companies can realistically produce. If US production capacity is not adequate, Medlock said there would be concerns over the availability of steel supply. Ed Hirs, an energy fellow and professor of economics at the University of Houston, said it was still too early to tell how the exclusions were going to work; the Commerce Department said the process could take up to 90 days. If a country or a company receives an exemption, Hirs said they would likely be treated like US domestic suppliers and raise their prices up to the level of countries who have to face import tariffs. He also said that exclusions on the domestic side for companies who import steel will be difficult to enforce. “Let’s say you and I are buying steel for our wells, and I get an exclusion for a contract that I have with Chinese steel with a 25% import tariff. If you’re buying from US steel, they’re just going to raise the price up to that tariff. You’re going to be paying 25% more for your steel than I am. There’s an issue of equity, and the fact that imported steel is still a majority product in the US,” Hirs said. The effects of the tariffs on the global oil trade are yet to be seen, but analysts say it is questionable whether operators will feel a significant pinch. Hirs said the price of steel may not be enough to curtail activity if the oil price continues to rise, and that operators may view it as the cost of doing business despite the lower margins. “The industry’s going to complain about it. The steel mills domestically are going to make more money and be happy about it. The general inflation will happen across every industry that uses steel—that would include rail transport and pipelines. Is that going to cut exploration and development? I don’t think the answer to that is anything other than ‘nah, it’s going to be an inconvenience,’” Hirs said. Medlock also doesn’t see the tariff impinging on operators’ ability to expand if the oil price continues to rise, but it still may have a ripple effect. Operational costs take a variety of factors into consideration such as the costs of delivering services to the wellsite, water services, and sand management, and each of these things make up a bigger percentatge of the cost of a well than the steel tariff. However, he said the tariff eats away at a thin margin, so if project costs rise with the oil price, this will put more demand on those other factors. Medlock said there are a lot of potential dynamic impacts the tariff policy could have on the supply chain. If country exemptions are resolved in quantity-based restrictions, then operators could be limited in their ability to scale up their projects because of a lack of supply. That limit could then ripple through the supply chain to drive up steel prices considerably. However, Medlock also said it is too early to see how that plays out. Fitzsimmons said that, regardless of the oil price, the tariffs are already having an effect on operators. “I know that a lot of operators have been looking at their portfolio of projects and at what the effect of the steel tariff has been on each of those individual projects to try and reassess if they’re going to go through them or not. A lower oil price is just going to further hurt the economics to where they’ll see if these projects are economically viable,” he said. One area where operators might feel an immediate pinch from the tariffs is with pipelines. US pipeline construction and repair activity rely heavily on imported finished goods and imported parts used for domestic manufacturing of line pipe, fittings, and valves. In recent years, 72% of steel used in line pipe was imported, and half of these imports of steel used in line pipe come from countries on which the US has already levied anti-dumping and countervailing duties, according to API. ICF released a study last year examining the effects of trade or purchasing restrictions that raised line pipe costs by 25%. This action, the group said, translated into a $76-million cost increase for a 280-mile pipeline project, or a $300-million cost increase for a major cross-country pipeline project. Such a cost increase may result in delayed projects or outright cancellations. In a statement discussing the tariffs, the AOPL said that US steel producers do not make enough pipeline-grade steel to satisfy industry needs in the midst of a reduction of imports. The group said that pipeline-grade steel is a niche, accounting for 3% of the total steel market. It is also a specialty product, meaning that it must meet quality specifications not required for other steel products (e.g., pipeline steel cannot be brittle for fear of a crack that could cause an incident). The ICF report looked at how import restrictions would affect market competition (Fig. 2). Quotas that limit the importation of line pipe, as well as the cut-to-length plates and plate coils from which line pipe is made, would substantially reduce supply volumes available to the market. The report also said that import restrictions will increase industrial concentration in portions of the US domestic markets for finished line pipe and related intermediate goods. Fig. 2—Import restrictions such as a tariff would substantially reduce supply volumes, increasing market concentration for specific types of steel pipe components. Source: ICF. Medlock said that pipeline construction should still be a viable decision for operators because pipelines are still cheaper alternatives to trucks and rail, but a price increase would affect producers and consumers. Given sufficient investments by the US steel industry, the constraints in meeting line pipe demand can be eliminated over time, said ICF. However, there are concerns that may affect the steel industry’s willingness to make those investments. For one, the cyclical nature of oil and gas exploration and production, as well as pipeline construction, means that steel production from any new manufacturing capacity will vary substantially from year to year, making timely cost recovery less certain. Also, the inherent uncertainty of long-term legal and political viability of any proposed domestic pipeline adds risk to steel manufacturing investments. Given those concerns, ICF said that US manufacturers of line pipe, cut-to-length plate, and plate coils may delay needed investments or demand higher prices to pay back those investments in order to spend the money needed to ramp up production.